Gully Boy movie review: Ranveer Singh&#039;s blazing performance in Zoya Akhtar&#039;s erudite directorial is whistle worthy! For a film that is about protest music, Gully Boy is surprisingly quiet. 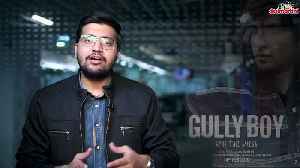 Its understatedness is one of multiple reasons why it is is also one of the best films to emerge from the Hindi cinemascape in..
▶ Videos for "Gully Boy Movie Review"